House cleaning isn’t hard at all – that is, if you’re organized. But too many of us jump right in with an ad-hoc, here and there sort of approach. If you take some time upfront to think about your strategy before you begin, then the process becomes much easier. Here are some solid tips for getting organized and helping to make your house cleaning a breeze. Try to avoid launching into your house cleaning without making a good solid plan first. Instead, start by designing a route which allows you to work your way from one end of the house to the other. Going at it chaotically and randomly only makes the whole process feel so much more insurmountable. Everywhere you look, you’ll see mess, and this will only make you feel like you’re not getting stuff done. When you work your way through methodically, it gives you a sense of accomplishment and completion as you conquer each stage. It’s generally a good idea to consider developing a room-by-room plan. You can start with the hard rooms and work your way to the easier rooms, or vice versa. There are advantages to both. Starting with the harder rooms means the worst of it’s over. Starting easy can help you get your flow going. Give it a little thought and let that decide where you start. An alternative to the room-by-room plan is to utilize a task-by-task type approach. This involves focusing on finishing one task type throughout the whole house first, before moving to the next. For example, you may start by doing the vacuum cleaning, then moving to the mopping, next to the dusting, and so on. Experiment a little and find out what works for you. You may decide to use a combination of both approaches. Once you’ve got your route planned, go through with a notebook and make a checklist. Look at every area of the house and identify everything that needs to be done. This keeps any little surprises from popping up along the way. It also helps you plan what supplies you’ll need. You’ll also be doing this in order to find trouble spots. Some things are going to take more time and work, and it’s good to know beforehand so you can be ready for it. You also may want to save the really tough stuff for later after you’ve done all the big house cleaning. It also really helps you to visualize your sense of accomplishment as you work your way through the checklist; it’s very satisfying to be able to put a big tick against an action item. Now that you know exactly what needs to be cleaned and how, you’ll need to get your supplies together. 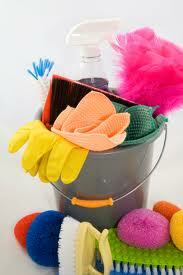 Expert house cleaners will tell you that a few good products and supplies can do most of your cleaning. Don’t get too caught up in upgrading or buying stuff. Some folks get so carried away shopping for the big house cleaning day that the actual cleaning never happens. And if you do need to buy some stuff, buy green products. These are all-natural, non-toxic and good for the earth. It’s a big thing in the cleaning world nowadays, so you shouldn’t have any trouble finding all-natural everything at your local supply shop. If for some reason you do find it hard to buy green cleaning products locally, then starting thinking about shopping online. Now you’ve finally got to do the dirty work. But there are some things you can do to make it nicer for you. – Listen to some music. This is a proven way to make a day of house cleaning into a party for all involved. – Take breaks. Take LOTS of breaks. If you need to, set up a work schedule so that you get a break before you get too tired. You can also reward yourself whenever you’ve completed a certain portion of the house. – Be realistic. If you’re house cleaning is going to take 3 days, let it take 3 days. You should really think about how much you can do and know when it’s time to call it a day. This article was written by United Home Services, one of Australia’s largest house cleaning franchises. But, at least it gets done and I don’t get overwhelmed. Before, I would get so frustrated because I didn’t finish and I was exhausted.